Hattie Bond was born March 6, 1937 in Brownsville, Tennessee, the eldest of five children. She died in Nashville Tennessee on Saturday, June 23, 2012, at the age of 75. Hattie Bond was a school librarian until she lost her vision in the early 1980s. After she adapted to her sight loss, she formed a support group, first known as new Visions and later as Second Sight, which provided support and information to seniors with recent vision loss. She did this for over 20 years. She was president of the Tennessee Council of the Blind from 1997 to 2003. She served on the board of the Nashville chapter for many years. Hattie attended several national conventions, where she was an active member of the Multicultural Committee. 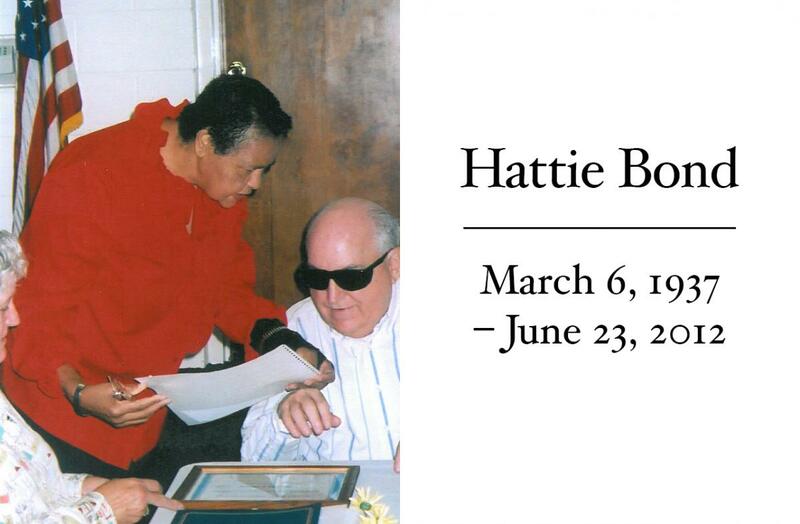 Hattie did a lot of volunteer work for her church and for her sorority at Tennessee State University. Hattie was married to her husband, Albert Bond, for 50 years. They had one daughter. Just as important as her list of activities was her compassion and quiet assistance to others. She often donated food or money to members in need, doing it quietly so no one was embarrassed. She was a mentor to many of us. For years before conference calls, we held our board meetings at her home in Nashville. She was always a gracious hostess and cooked delicious food for us. Hattie was always a peacemaker, resolving conflicts and providing wise counsel. Every chapter could use someone with her multiple talents and we will miss her for a long time.